More Renzo Piano at the L.A. County Museum of Art (LACMA). So how’s that going? A one story, glass-filled, pavilion for galleries. (Official info on this building at the bottom.) You’ll see bountiful L.A. light coming in from the top, modulated by one of those finned grill systems that Renzo Piano Building Workshop does so well. LACMA’s leader Michael Govan says that our favorite museums are one-story structures. Think about it. He may be right. Just a few months ago the site for LACMA’s new Resnick Pavilion, as it’s to be called, was barren. Today I went to LACMA for a preview of “The Art of Two Germanys – Cold War Culture.” We were blessed with rain, fitting of a show that took me back to Berlin. And, seizing the opportunity to find anything but blue skies here in L.A., I snapped these photos of the construction of LACMA’s Resnick Pavilion. The Resnick Pavilion will be a single-story, glass and stone-enclosed structure sited north of the Broad Contemporary Art Museum (BCAM). The new building… is intended to house special exhibitions, freeing up existing gallery space for LACMA’s robust permanent collection. Architecturally, the Resnick Pavilion will complement BCAM—both buildings feature glass roof and ceiling elements that will flood the galleries with natural light. The Resnick Pavilion’s exterior will be a combination of glass and travertine marble, and its interior galleries will be a flexible open plan that can accommodate multiple exhibitions at once as well as large-scale works of art. Construction on the new building commenced in 2008 and is slated for completion in mid 2010. 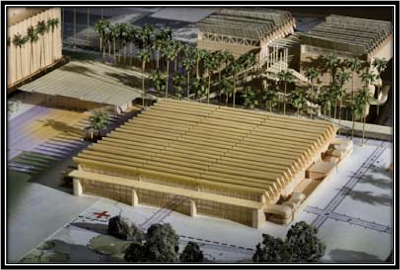 Model, northern aerial view, Lynda and Stewart Resnick Exhibition Pavilion, Renzo Piano Building Workshop, architects, photo © 2008 Museum Associates/LACMA. For Renzo in Chicago, the current expansion of the Art Institute, click here. You are currently browsing the archives for the BCAM category.